Are you interested in learning Korean? Do you want a flexible service that can fit your schedule? Want to try out our services for a discounted price plus get a free coffee? Then why not signup for our Christmas ₩20,000 Korean Trial lesson + Coffee. We are offering these trial lessons in Incheon, Bucheon and parts of Western Seoul but only until December 31st 2012. We will keep it very simple and even meet you at your favorite local coffee shop (as we don’t want you to get lost), plus we will bring a selection of textbooks and materials so you can see what we can offer you. Also if you want to make it a couple or pairs trial just add an extra ₩5,000. If you are able to come to the Gyesan Station area in Incheon the price will be discounted further. Interested in learning some Korean? Got some free time this month? Then why not take us up on our special offer? 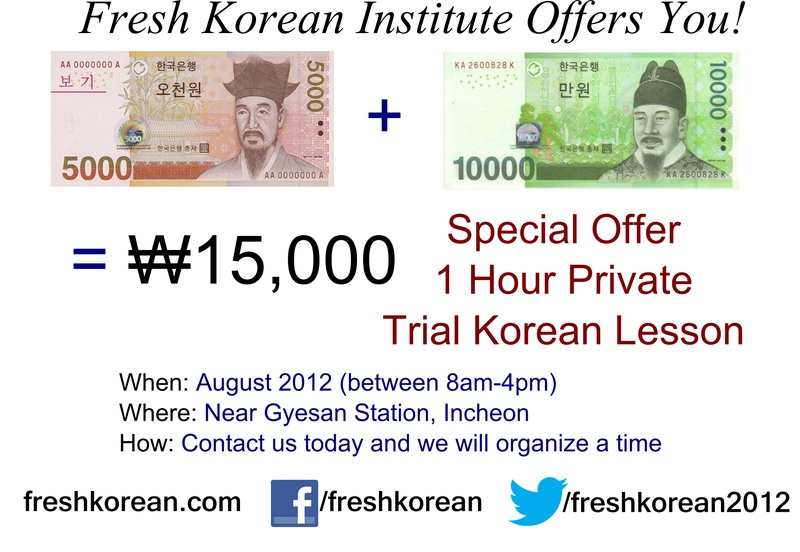 We are offering all new customers this great deal to sample what we at the Fresh Korean Institute have to offer. For only ₩15,000 you will receive a one hour private lesson plus a complementary notebook and pencil. The only two conditions are that the lesson takes place between 8am & 4pm and is taken close to Gyesan Station (계산역) which is in northern Incheon. If you have any questions (FAQ) or would like to signup for your special offer private lesson please either email us at: freshkoreaninstitute@gmail.com or call our office 070-7390-1719. We hope to speak to you soon.